Proprietary Name: Latuda What is the Proprietary Name? Non-Proprietary Name: Lurasidone Hydrochloride What is the Non-Proprietary Name? Latuda with NDC 70518-1936 is a a human prescription drug product labeled by Remedyrepack Inc.. The generic name of Latuda is lurasidone hydrochloride. The product's dosage form is tablet, film coated and is administered via oral form. FDA Application Number: NDA200603 What is the FDA Application Number? )].Suicidal Thoughts and BehaviorsAntidepressants increased the risk of suicidal thoughts and behavior in pediatric and young adults in short-term studies. Closely monitor all antidepressant-treated patients for clinical worsening, and for emergence of suicidal thoughts and behaviors.
. The maximum recommended dose is 160 mg per day.
. The maximum recommended dose is 80 mg per day.
. If LATUDA is used concomitantly with a moderate CYP3A4 inducer, it may be necessary to increase the LATUDA dose after chronic treatment (7 days or more) with the CYP3A4 inducer. Hyperglycemia and Diabetes MellitusHyperglycemia, in some cases extreme and associated with ketoacidosis or hyperosmolar coma or death, has been reported in patients treated with atypical antipsychotics. Assessment of the relationship between atypical antipsychotic use and glucose abnormalities is complicated by the possibility of an increased background risk of diabetes mellitus in patients with schizophrenia and the increasing incidence of diabetes mellitus in the general population. Given these confounders, the relationship between atypical antipsychotic use and hyperglycemia-related adverse events is not completely understood. However, epidemiological studies suggest an increased risk of hyperglycemia-related adverse events in patients treated with the atypical antipsychotics. Hyperglycemia, in some cases extreme and associated with ketoacidosis or hyperosmolar coma or death, has been reported in patients treated with atypical antipsychotics. Assessment of the relationship between atypical antipsychotic use and glucose abnormalities is complicated by the possibility of an increased background risk of diabetes mellitus in patients with schizophrenia and the increasing incidence of diabetes mellitus in the general population. Given these confounders, the relationship between atypical antipsychotic use and hyperglycemia-related adverse events is not completely understood. However, epidemiological studies suggest an increased risk of hyperglycemia-related adverse events in patients treated with the atypical antipsychotics. In the uncontrolled, longer-term schizophrenia studies (primarily open-label extension studies), LATUDA was associated with a mean change in glucose of +1.8 mg/dL at week 24 (n=355), +0.8 mg/dL at week 36 (n=299) and +2.3 mg/dL at week 52 (n=307). AdolescentsIn studies of adolescents and adults with schizophrenia, changes in fasting glucose were similar. In the short-term, placebo-controlled study of adolescents, fasting serum glucose mean values were -1.3 mg/dL for placebo (n=95), +0.1 mg/dL for 40 mg/day (n=90), and +1.8 mg/dL for 80 mg/day (n=92). In the uncontrolled, open-label, longer-term bipolar depression study, patients who received LATUDA as monotherapy in the short-term study and continued in the longer-term study, had a mean change in glucose of +1.2 mg/dL at week 24 (n=129). Patients were randomized to flexibly dosed LATUDA 20 to 120 mg/day or placebo as adjunctive therapy with lithium or valproate. In the uncontrolled, open-label, longer-term bipolar depression study, patients who received LATUDA as adjunctive therapy with either lithium or valproate in the short-term study and continued in the longer-term study, had a mean change in glucose of +1.7 mg/dL at week 24 (n=88). Pediatric Patients (10 to 17 years)In studies of pediatric patients 10 to 17 years and adults with bipolar depression, changes in fasting glucose were similar. In the 6-week, placebo-controlled study of pediatric patients with bipolar depression, mean change in fasting glucose was +1.6 mg/dL for LATUDA 20 to 80 mg/day (n=145) and -0.5 mg/dL for placebo (n=145). In studies of pediatric patients 10 to 17 years and adults with bipolar depression, changes in fasting glucose were similar. In the 6-week, placebo-controlled study of pediatric patients with bipolar depression, mean change in fasting glucose was +1.6 mg/dL for LATUDA 20 to 80 mg/day (n=145) and -0.5 mg/dL for placebo (n=145). In the uncontrolled, longer-term schizophrenia studies (primarily open-label extension studies), LATUDA was associated with a mean change in total cholesterol and triglycerides of -3.8 (n=356) and -15.1 (n=357) mg/dL at week 24, -3.1 (n=303) and -4.8 (n=303) mg/dL at week 36 and -2.5 (n=307) and -6.9 (n=307) mg/dL at week 52, respectively. AdolescentsIn the adolescent short-term, placebo-controlled study, fasting serum cholesterol mean values were -9.6 mg/dL for placebo (n=95), -4.4 mg/dL for 40 mg/day (n=89), and +1.6 mg/dL for 80 mg/day (n=92), and fasting serum triglyceride mean values were +0.1 mg/dL for placebo (n=95), -0.6 mg/dL for 40 mg/day (n=89), and +8.5 mg/dL for 80 mg/day (n=92). In the uncontrolled, open-label, longer-term bipolar depression study, patients who received LATUDA as monotherapy in the short-term and continued in the longer-term study had a mean change in total cholesterol and triglycerides of -0.5 mg/dL (n=130) and -1.0 mg/dL (n=130) at week 24, respectively. In the uncontrolled, open-label, longer-term bipolar depression study, patients who received LATUDA, as adjunctive therapy with either lithium or valproate in the short-term study and continued in the longer-term study, had a mean change in total cholesterol and triglycerides of -0.9 (n=88) and +5.3 (n=88) mg/dL at week 24, respectively. Pediatric Patients (10 to 17 years)In the 6-week, placebo-controlled bipolar depression study with pediatric patients 10 to 17 years, mean change in fasting cholesterol was -6.3 mg/dL for LATUDA 20 to 80 mg/day (n=144) and -1.4 mg/dL for placebo (n=145), and mean change in fasting triglyceride was -7.6 mg/dL for LATUDA 20 to 80 mg/day (n=144) and +5.9 mg/dL for placebo (n=145). In the 6-week, placebo-controlled bipolar depression study with pediatric patients 10 to 17 years, mean change in fasting cholesterol was -6.3 mg/dL for LATUDA 20 to 80 mg/day (n=144) and -1.4 mg/dL for placebo (n=145), and mean change in fasting triglyceride was -7.6 mg/dL for LATUDA 20 to 80 mg/day (n=144) and +5.9 mg/dL for placebo (n=145). , respectively. The proportion of patients with a ≥7% increase in body weight (at Endpoint) was 4.8% for LATUDA-treated patients and 3.3% for placebo-treated patients. In the uncontrolled, longer-term schizophrenia studies (primarily open-label extension studies), LATUDA was associated with a mean change in weight of -0.69 kg at week 24 (n=755), -0.59 kg at week 36 (n=443) and -0.73 kg at week 52 (n=377). Table 10. The mean change in weight gain was +0.5 kg for LATUDA-treated patients compared to +0.2 kg for placebo-treated patients. The proportion of patients with a ≥7% increase in body weight (at Endpoint) was 3.3% for LATUDA-treated patients and 4.5% for placebo-treated patients. Table 11. The mean change in weight gain was +0.29 kg for LATUDA-treated patients compared to -0.04 kg for placebo-treated patients. The proportion of patients with a ≥7% increase in body weight (at Endpoint) was 2.4% for LATUDA-treated patients and 0.7% for placebo-treated patients. In the uncontrolled, open-label, longer-term bipolar depression study, patients who received LATUDA as monotherapy in the short-term and continued in the longer-term study had a mean change in weight of -0.02 kg at week 24 (n=130). Table 12. The mean change in weight gain was +0.11 kg for LATUDA-treated patients compared to +0.16 kg for placebo-treated patients. The proportion of patients with a ≥7% increase in body weight (at Endpoint) was 3.1% for LATUDA-treated patients and 0.3% for placebo-treated patients. In the uncontrolled, open-label, longer-term bipolar depression study, patients who were treated with LATUDA, as adjunctive therapy with either lithium or valproate in the short-term and continued in the longer-term study, had a mean change in weight of +1.28 kg at week 24 (n=86).
. The mean change in weight gain was +0.7 kg for LATUDA-treated patients compared to +0.5 kg for placebo-treated patients. The proportion of patients with a ≥7% increase in body weight (at Endpoint) was 4.0% for LATUDA-treated patients and 5.3% for placebo-treated patients. Table 13. The mean change in weight gain was +0.7 kg for LATUDA-treated patients compared to +0.5 kg for placebo-treated patients. The proportion of patients with a ≥7% increase in body weight (at Endpoint) was 4.0% for LATUDA-treated patients and 5.3% for placebo-treated patients. The proportion of patients with prolactin elevations ≥5× upper limit of normal (ULN) was 2.8% for LATUDA-treated patients and = 1.0% for placebo-treated patients. The proportion of female patients with prolactin elevations ≥5x ULN was 5.7% for LATUDA-treated patients and = 2.0% for placebo-treated female patients. The proportion of male patients with prolactin elevations ≥5x ULN was 1.6% and 0.6% for placebo-treated male patients. In the uncontrolled longer-term schizophrenia studies (primarily open-label extension studies), LATUDA was associated with a median change in prolactin of -0.9 ng/mL at week 24 (n=357), -5.3ng/mL at week 36 (n=190) and -2.2 ng/mL at week 52 (n=307). The proportion of patients with prolactin elevations ≥5x ULN was 0.5% for LATUDA-treated patients and 1.0% for placebo-treated patients. The proportion of female patients with prolactin elevations ≥5x ULN was 1.3% for LATUDA-treated patients and 0% for placebo-treated female patients. The proportion of male patients with prolactin elevations ≥5x ULN was 0% for LATUDA treated patients and 1.6% for placebo-treated male patients. The proportion of patients with prolactin elevations ≥5x upper limit of normal (ULN) was 0.4% for LATUDA-treated patients and 0.0% for placebo-treated patients. The proportion of female patients with prolactin elevations ≥5x ULN was 0.6% for LATUDA-treated patients and 0% for placebo-treated female patients. The proportion of male patients with prolactin elevations ≥5x ULN was 0% and 0% for placebo-treated male patients. In the uncontrolled, open-label, longer-term bipolar depression study, patients who were treated with LATUDA as monotherapy in the short-term and continued in the longer-term study, had a median change in prolactin of -1.15 ng/mL at week 24 (n=130). The proportion of patients with prolactin elevations ≥5x upper limit of normal (ULN) was 0.0% for LATUDA-treated patients and 0.0% for placebo-treated patients. The proportion of female patients with prolactin elevations ≥5x ULN was 0% for LATUDA-treated patients and 0% for placebo-treated female patients. The proportion of male patients with prolactin elevations ≥5x ULN was 0% and 0% for placebo-treated male patients. In the uncontrolled, open-label, longer-term bipolar depression study, patients who were treated with LATUDA, as adjunctive therapy with either lithium or valproate, in the short-term and continued in the longer-term study, had a median change in prolactin of -2.9 ng/mL at week 24 (n=88). The proportion of patients with prolactin elevations ≥5x ULN was 0% for LATUDA-treated patients and 0.6% for placebo-treated patients. The proportion of female patients with prolactin elevations ≥5x ULN was 0% for LATUDA-treated patients and 1.3% for placebo-treated female patients. No male patients in the placebo or LATUDA treatment groups had prolactin elevations ≥5x ULN. AdultsThe incidence of orthostatic hypotension and syncope reported as adverse events from short-term, placebo-controlled schizophrenia studies was (LATUDA incidence, placebo incidence): orthostatic hypotension [0.3% (5/1508), 0.1% (1/708)] and syncope [0.1% (2/1508), 0% (0/708)]. In short-term schizophrenia clinical studies, orthostatic hypotension, as assessed by vital signs, occurred with a frequency of 0.8% with LATUDA 40 mg, 2.1% with LATUDA 80 mg, 1.7% with LATUDA 120 mg and 0.8% with LATUDA 160 mg compared to 0.7% with placebo. AdolescentsThe incidence of orthostatic hypotension reported as adverse events from the short-term, placebo-controlled adolescent schizophrenia study was 0.5% (1/214) in LATUDA-treated patients and 0% (0/112) in placebo-treated patients. No syncope event was reported. Orthostatic hypotension, as assessed by vital signs, occurred with a frequency of 0% with LATUDA 40 mg and 2.9% with LATUDA 80 mg, compared to 1.8% with placebo. MonotherapyIn the adult short-term, flexible-dose, placebo-controlled monotherapy bipolar depression study, there were no reported adverse events of orthostatic hypotension and syncope. Orthostatic hypotension, as assessed by vital signs, occurred with a frequency of 0.6% with LATUDA 20 to 60 mg and 0.6% with LATUDA 80 to 120 mg compared to 0% with placebo. Adjunctive Therapy with Lithium or ValproateIn the adult short-term, flexible-dose, placebo-controlled adjunctive therapy bipolar depression therapy studies, there were no reported adverse events of orthostatic hypotension and syncope. Orthostatic hypotension, as assessed by vital signs, occurred with a frequency of 1.1% with LATUDA 20 to 120 mg compared to 0.9% with placebo. Pediatric Patients (10 to 17 years)In the 6-week, placebo-controlled bipolar depression study in pediatric patients 10 to 17 years, there were no reported adverse events of orthostatic hypotension or syncope. In the 6-week, placebo-controlled bipolar depression study in pediatric patients 10 to 17 years, there were no reported adverse events of orthostatic hypotension or syncope. Orthostatic hypotension, as assessed by vital signs, occurred with a frequency of 1.1% with LATUDA 20 to 80 mg/day, compared to 0.6% with placebo. MonotherapyIn the adult and pediatric 6-week, flexible-dose, placebo-controlled monotherapy bipolar depression studies, no patients experienced seizures/convulsions. In the adult and pediatric 6-week, flexible-dose, placebo-controlled monotherapy bipolar depression studies, no patients experienced seizures/convulsions. Adjunctive Therapy with Lithium or ValproateIn the adult short-term, flexible-dose, placebo-controlled adjunctive therapy bipolar depression studies, no patient experienced seizures/convulsions. AdultsIn short-term, placebo-controlled schizophrenia studies, somnolence was reported by 17.0% (256/1508) of patients treated with LATUDA (15.5% LATUDA 20 mg, 15.6% LATUDA 40 mg, 15.2% LATUDA 80 mg, 26.5% LATUDA 120 mg and 8.3% LATUDA 160 mg/day) compared to 7.1% (50/708) of placebo patients. AdolescentsIn the short-term, placebo-controlled adolescent schizophrenia study, somnolence was reported by 14.5% (31/214) of patients treated with LATUDA (15.5% LATUDA 40 mg and 13.5% LATUDA 80 mg,/day) compared to 7.1% (8/112) of placebo patients. MonotherapyIn the adult short-term, flexible-dosed, placebo-controlled monotherapy bipolar depression study, somnolence was reported by 7.3% (12/164) and 13.8% (23/167) with LATUDA 20 to 60 mg and 80 to120 mg, respectively compared to 6.5% (11/168) of placebo patients. Adjunctive Therapy with Lithium or ValproateIn the adult short-term, flexible-dosed, placebo-controlled adjunctive therapy bipolar depression studies, somnolence was reported by 11.4% (41/360) of patients treated with LATUDA 20-120 mg compared to 5.1% (17/334) of placebo patients. Pediatric Patients (10 to 17 years)In the 6-week, placebo-controlled bipolar depression study in pediatric patients 10 to 17 years, somnolence was reported by 11.4% (20/175) of patients treated with LATUDA 20 to 80 mg/day compared to 5.8% (10/172) of placebo treated patients. In the 6-week, placebo-controlled bipolar depression study in pediatric patients 10 to 17 years, somnolence was reported by 11.4% (20/175) of patients treated with LATUDA 20 to 80 mg/day compared to 5.8% (10/172) of placebo treated patients. AdultsThe information below is derived from an integrated clinical study database for LATUDA consisting of 3799 adult patients exposed to one or more doses of LATUDA for the treatment of schizophrenia, and bipolar depression in placebo-controlled studies. This experience corresponds with a total experience of 1250.9 patient-years. A total of 1106 LATUDA-treated patients had at least 24 weeks and 371 LATUDA-treated patients had at least 52 weeks of exposure. SchizophreniaThe following findings are based on the short-term, placebo-controlled premarketing adult studies for schizophrenia in which LATUDA was administered at daily doses ranging from 20 to 160 mg (n=1508). Commonly Observed Adverse Reactions: The most common adverse reactions (incidence ≥ 5% and at least twice the rate of placebo) in patients treated with LATUDA were somnolence, akathisia, extrapyramidal symptoms, and nausea. Adverse Reactions Associated with Discontinuation of Treatment: A total of 9.5% (143/1508) LATUDA-treated patients and 9.3% (66/708) of placebo-treated patients discontinued due to adverse reactions. There were no adverse reactions associated with discontinuation in subjects treated with LATUDA that were at least 2% and at least twice the placebo rate. Dose-Related Adverse Reactions in the Schizophrenia StudiesAkathisia and extrapyramidal symptoms were dose-related. The frequency of akathisia increased with dose up to 120 mg/day (5.6% for LATUDA 20 mg, 10.7% for LATUDA 40 mg, 12.3% for LATUDA 80 mg, and 22.0% for LATUDA 120 mg). Akathisia was reported by 7.4% (9/121) of patients receiving 160 mg/day. Akathisia occurred in 3.0% of subjects receiving placebo. The frequency of extrapyramidal symptoms increased with dose up to 120 mg/day (5.6% for LATUDA 20 mg, 11.5% for LATUDA 40 mg, 11.9% for LATUDA 80 mg, and 22.0% for LATUDA 120 mg). Bipolar Depression (Monotherapy)The following findings are based on the adult short-term, placebo-controlled premarketing study for bipolar depression in which LATUDA was administered at daily doses ranging from 20 to 120 mg (n=331). Commonly Observed Adverse Reactions: The most common adverse reactions (incidence ≥5%, in either dose group, and at least twice the rate of placebo) in patients treated with LATUDA were akathisia, extrapyramidal symptoms, somnolence, nausea, vomiting, diarrhea, and anxiety. Adverse Reactions Associated with Discontinuation of Treatment: A total of 6.0% (20/331) LATUDA-treated patients and 5.4% (9/168) of placebo-treated patients discontinued due to adverse reactions. There were no adverse reactions associated with discontinuation in subjects treated with LATUDA that were at least 2% and at least twice the placebo rate.
] the adverse reactions that occurred with a greater than 5% incidence in the patients treated with LATUDA in any dose group and greater than placebo in both groups were nausea (10.4%, 17.4%), somnolence (7.3%, 13.8%), akathisia (7.9%, 10.8%), and extrapyramidal symptoms (4.9%, 9.0%) for LATUDA 20 to 60 mg/day and LATUDA 80 to 120 mg/day, respectively. Adjunctive Therapy with Lithium or ValproateThe following findings are based on two adult short-term, placebo-controlled premarketing studies for bipolar depression in which LATUDA was administered at daily doses ranging from 20 to 120 mg as adjunctive therapy with lithium or valproate (n=360). Commonly Observed Adverse Reactions: The most common adverse reactions (incidence ≥5% and at least twice the rate of placebo) in subjects treated with LATUDA were akathisia and somnolence. Adverse Reactions Associated with Discontinuation of Treatment: A total of 5.8% (21/360) LATUDA-treated patients and 4.8% (16/334) of placebo-treated patients discontinued due to adverse reactions. There were no adverse reactions associated with discontinuation in subjects treated with LATUDA that were at least 2% and at least twice the placebo rate. SchizophreniaThe following findings are based on the short-term, placebo-controlled adolescent study for schizophrenia in which LATUDA was administered at daily doses ranging from 40 (N=110) to 80 mg (N=104). Commonly Observed Adverse Reactions: The most common adverse reactions (incidence ≥5% and at least twice the rate of placebo) in adolescent patients (13 to 17 years) treated with LATUDA were somnolence, nausea, akathisia, extrapyramidal symptoms (non-akathisia, 40mg only), vomiting, and rhinorrhea/rhinitis (80mg only). Adverse Reactions Associated with Discontinuation of Treatment: The incidence of discontinuation due to adverse reactions between LATUDA- and placebo-treated adolescent patients (13 to 17 years) was 4% and 8%, respectively. Bipolar DepressionThe following findings are based on the 6-week , placebo-controlled study for bipolar depression in pediatric patients 10 to 17 years in which LATUDA was administered at daily doses ranging from 20 to 80 mg (N=175). Commonly Observed Adverse Reactions: The most common adverse reactions (incidence ≥5%, and at least twice the rate of placebo) in pediatric patients (10 to 17 years) treated with LATUDA were nausea, weight increase, and insomnia. Adverse Reactions Associated with Discontinuation of Treatment: The incidence of discontinuation due to adverse reactions between LATUDA- and placebo-treated pediatric patients 10 to 17 years was 2% and 2%, respectively. AdultsThe mean change from baseline for LATUDA-treated patients for the SAS, BAS and AIMS was comparable to placebo-treated patients, with the exception of the Barnes Akathisia Scale global score (LATUDA, 0.1; placebo, 0.0). The percentage of patients who shifted from normal to abnormal was greater in LATUDA-treated patients and placebo for the BAS (LATUDA, 14.4%; placebo, 7.1%), the SAS (LATUDA, 5.0%; placebo, 2.3%) and the AIMS (LATUDA, 7.4%; placebo, 5.8%). 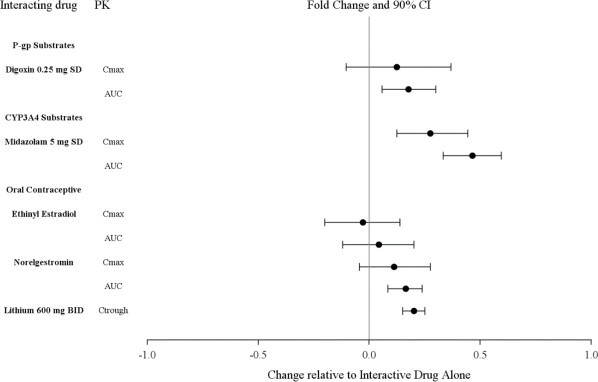 AdolescentsThe mean change from baseline for LATUDA- treated patients with adolescent schizophrenia for the SAS, BAS and AIMS was comparable to placebo-treated patients. The percentage of patients who shifted from normal to abnormal was greater in LATUDA-treated patients and placebo for the BAS (LATUDA, 7.0%; placebo, 1.8%), the SAS (LATUDA, 8.3%; placebo, 2.7%) and the AIMS (LATUDA, 2.8%; placebo, 0.9%). MonotherapyThe mean change from baseline for LATUDA-treated adult patients for the SAS, BAS and AIMS was comparable to placebo-treated patients. The percentage of patients who shifted from normal to abnormal was greater in LATUDA-treated patients and placebo for the BAS (LATUDA, 8.4%; placebo, 5.6%), the SAS (LATUDA, 3.7%; placebo, 1.9%) and the AIMS (LATUDA, 3.4%; placebo, 1.2%). Adjunctive Therapy with Lithium or ValproateThe mean change from baseline for LATUDA-treated adult patients for the SAS, BAS and AIMS was comparable to placebo-treated patients. The percentage of patients who shifted from normal to abnormal was greater in LATUDA-treated patients and placebo for the BAS (LATUDA, 8.7%; placebo, 2.1%), the SAS (LATUDA, 2.8%; placebo, 2.1%) and the AIMS (LATUDA, 2.8%; placebo, 0.6%). Pediatric Patients (10 to 17 years)The mean change from baseline for LATUDA- treated pediatric patients 10 to 17 years with bipolar depression for the SAS, BAS and AIMS was comparable to placebo-treated patients. The percentage of patients who shifted from normal to abnormal was greater in LATUDA-treated patients and placebo for the BAS (LATUDA, 4.6%; placebo, 2.4%), the SAS (LATUDA, 0.6%; placebo, 0%) and was the same for the AIMS (LATUDA, 0%; placebo, 0%). AdultsIn the short-term, placebo-controlled schizophrenia clinical studies, dystonia occurred in 4.2% of LATUDA-treated subjects (0.0% LATUDA 20 mg, 3.5% LATUDA 40 mg, 4.5% LATUDA 80 mg, 6.5% LATUDA 120 mg and 2.5% LATUDA 160 mg) compared to 0.8% of subjects receiving placebo. Seven subjects (0.5%, 7/1508) discontinued clinical trials due to dystonic events – four were receiving LATUDA 80 mg/day and three were receiving LATUDA 120 mg/day. AdolescentsIn the short-term, placebo-controlled, adolescent schizophrenia study, dystonia occurred in 1% of LATUDA-treated patients (1% LATUDA 40 mg and 1% LATUDA 80 mg) compared to 0% of patients receiving placebo. No patients discontinued the clinical study due to dystonic events. MonotherapyIn the adult short-term, flexible-dose, placebo-controlled monotherapy bipolar depression study, dystonia occurred in 0.9% of LATUDA-treated subjects (0.0% and 1.8% for LATUDA 20 to 60 mg/day and LATUDA 80 to 120 mg/day, respectively) compared to 0.0% of subjects receiving placebo. No subject discontinued the clinical study due to dystonic events. Adjunctive Therapy with Lithium or ValproateIn the adult short-term, flexible-dose, placebo-controlled adjunctive therapy bipolar depression studies, dystonia occurred in 1.1% of LATUDA-treated subjects (20 to 120 mg) compared to 0.6% of subjects receiving placebo. No subject discontinued the clinical study due to dystonic events. Pediatric Patients (10 to 17 years)In the 6-week, placebo-controlled bipolar depression study in pediatric patients 10 to 17 years, dystonia occurred in 0.6% of LATUDA-treated patients compared to 1.2% of patients receiving placebo. No patients discontinued the clinical study due to dystonic events. Table 19 or those that appear elsewhere in the LATUDA label are not included. The estimated background risk of major birth defects and miscarriage for the indicated population(s) is unknown. All pregnancies have a background risk of birth defect, loss or other adverse outcomes. In the U.S. general population, the estimated background risk of major birth defects and miscarriage in clinically recognized pregnancies is 2-4% and 15-20%, respectively. Fetal/Neonatal Adverse ReactionsExtrapyramidal and/or withdrawal symptoms, including agitation, hypertonia, hypotonia, tremor, somnolence, respiratory distress and feeding disorder have been reported in neonates who were exposed to antipsychotic drugs during the third trimester of pregnancy. These symptoms have varied in severity. Some neonates recovered within hours or days without specific treatment; others required prolonged hospitalization. Monitor neonates for extrapyramidal and/or withdrawal symptoms and manage symptoms appropriately. Risk SummaryLactation studies have not been conducted to assess the presence of lurasidone in human milk, the effects on the breastfed infant, or the effects on milk production. Lurasidone is present in rat milk. The development and health benefits of breastfeeding should be considered along with the mother's clinical need for LATUDA and any potential adverse effects on the breastfed infant from LATUDA or from the underlying maternal condition. The safety and effectiveness of LATUDA has not been established in pediatric patients less than 13 years of age with schizophrenia. The safety and effectiveness of LATUDA has not been established in pediatric patients less than 10 years of age with bipolar depression. Irritability Associated with Autistic DisorderThe effectiveness of LATUDA in pediatric patients for the treatment of irritability associated with autistic disorder has not been established. Efficacy was not demonstrated in a 6-week study evaluating LATUDA 20 mg/day and 60 mg/day for the treatment of pediatric patients 6 to 17 years of age with irritability associated with autistic disorder diagnosed by Diagnostic and Statistical Manual of Mental Disorder s, 4th Ed., Text Revision [DSM-IV-TR] criteria. The primary objective of the study as measured by improvement from Baseline in the irritability subscale of the Aberrant Behavior Checklist (ABC) at Endpoint (Week 6) was not met. A total of 149 patients were randomized to LATUDA or placebo. Vomiting occurred at a higher rate than reported in other LATUDA studies (4/49 or 8% for 20mg, 14/51 or 27% for 60mg, and 2/49 or 4% for placebo), particularly in children ages 6 to 12 (13 out of 18 patients on LATUDA with vomiting). ECG ChangesThe effects of LATUDA on the QTc interval were evaluated in a randomized, double-blind, multiple-dose, parallel-dedicated thorough QT study in 43 patients with schizophrenia or schizoaffective disorder, who were treated with LATUDA doses of 120 mg daily, 600 mg daily and completed the study. The maximum mean (upper 1-sided, 95% CI) increase in baseline-adjusted QTc intervals based on individual correction method (QTcI) was 7.5 (11.7) ms and 4.6 (9.5) ms, for the 120 mg and 600 mg dose groups respectively, observed at 2 to 4 hours after dosing. In this study, there was no apparent dose (exposure)-response relationship. In short-term, placebo-controlled studies in schizophrenia and bipolar depression, no post-baseline QT prolongations exceeding 500 msec were reported in patients treated with LATUDA or placebo. AdultsThe activity of LATUDA is primarily due to the parent drug. The pharmacokinetics of LATUDA is dose-proportional within a total daily dose range of 20 mg to 160 mg. Steady-state concentrations of LATUDA are reached within 7 days of starting LATUDA. Absorption and Distribution: LATUDA is absorbed and reaches peak serum concentrations in approximately 1-3 hours. It is estimated that 9-19% of an administered dose is absorbed. Following administration of 40 mg of LATUDA, the mean (%CV) apparent volume of distribution was 6173 (17.2) L. LATUDA is highly bound (~99%) to serum proteins. in vitro studies, LATUDA is not a substrate of CYP1A1, CYP1A2, CYP2A6, CYP4A11, CYP2B6, CYP2C8, CYP2C9, CYP2C19, CYP2D6 or CYP2E1 enzymes. Because LATUDA is not a substrate for CYP1A2, smoking is not expected to have an effect on the pharmacokinetics of LATUDA. Transporter proteins: In vitro studies suggest LATUDA is not a substrate of OATP1B1 or OATP1B3, however, is probably a substrate of P-gp and BCRP. In vitro studies indicate that LATUDA is not expected to inhibit transporters OATP1B1, OATP1B3, OCT1, OCT2, OAT1, OAT3, MATE1, MATE2-K and BSEP at clinically relevant concentrations. LATUDA is not a clinically significant inhibitor of P-gp. However, it may inhibit BCRP. Following administration of 40 mg of LATUDA, the mean (%CV) apparent clearance was 3902 (18.0) mL/min. Figure 1. A population PK analyses concluded that coadministration of lithium 300-2400 mg/day or valproate 300-2000 mg/day with lurasidone for up to 6 weeks has minimal effect on lurasidone exposure. Figure 2. A population PK analyses concluded that coadministration of lurasidone has minimal effect on lithium and valproate exposure when it is coadministered with lithium 300-2400 mg/day or valproate 300-2000 mg/day. Pediatric PatientsLATUDA exposure (i.e., steady-state Cmax and AUC) in children and adolescent patients (10 to 17 years of age) was generally similar to that in adults across the dose range from 40 to 160 mg, without adjusting for body weight. Carcinogenesis: Lurasidone increased incidences of malignant mammary gland tumors and pituitary gland adenomas in female mice orally dosed with 30, 100, 300, or 650 mg/kg/day. The lowest dose produced plasma levels (AUC) approximately equal to those in humans receiving the MRHD of 160 mg/day. No increases in tumors were seen in male mice up to the highest dose tested, which produced plasma levels (AUC) 14 times those in humans receiving the MRHD. 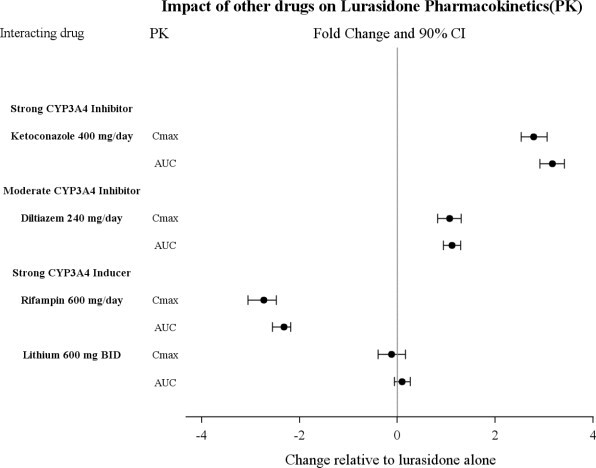 Lurasidone increased the incidence of mammary gland carcinomas in female rats orally dosed at 12 and 36 mg/kg/day: the lowest dose; 3 mg/kg/day is the no-effect dose which produced plasma levels (AUC) 0.4 times those in humans receiving the MRHD. No increases in tumors were seen in male rats up to the highest dose tested, which produced plasma levels (AUC) 6 times those in humans receiving the MRHD. AdultsThe efficacy of LATUDA for the treatment of schizophrenia was established in five short-term (6-week), placebo-controlled studies in adult patients (mean age of 38.4 years, range 18-72) who met DSM-IV criteria for schizophrenia. An active-control arm (olanzapine or quetiapine extended-release) was included in two studies to assess assay sensitivity. Positive and Negative Syndrome Scale (PANSS), is a multi-item inventory of general psychopathology used to evaluate the effects of drug treatment in schizophrenia. PANSS total scores may range from 30 to 210. Brief Psychiatric Rating Scale derived (BPRSd), derived from the PANSS, is a multi-item inventory primarily focusing on positive symptoms of schizophrenia, whereas the PANSS includes a wider range of positive, negative and other symptoms of schizophrenia. The BPRSd consists of 18 items rated on a scale of 1 (not present) to 7 (severe). BPRSd scores may range from 18 to 126. The Clinical Global Impression severity scale (CGI-S) is a clinician-rated scale that measures the subject's current illness state on a 1- to 7-point scale. The endpoint associated with each instrument is change from baseline in the total score to the end of week 6. These changes are then compared to placebo changes for the drug and control groups. Study 1: In a 6-week, placebo-controlled trial (N=145) involving two fixed doses of LATUDA (40 or 120 mg/day), both doses of LATUDA at Endpoint were superior to placebo on the BPRSd total score, and the CGI-S.
Study 2: In a 6-week, placebo-controlled trial (N=180) involving a fixed dose of LATUDA (80 mg/day), LATUDA at Endpoint was superior to placebo on the BPRSd total score, and the CGI-S.
Study 3: In a 6-week, placebo- and active-controlled trial (N=473) involving two fixed doses of LATUDA (40 or 120 mg/day) and an active control (olanzapine), both LATUDA doses and the active control at Endpoint were superior to placebo on the PANSS total score, and the CGI-S.
Study 4: In a 6-week, placebo-controlled trial (N=489) involving three fixed doses of LATUDA (40, 80 or 120 mg/day), only the 80 mg/day dose of LATUDA at Endpoint was superior to placebo on the PANSS total score, and the CGI-S.
Study 5: In a 6-week, placebo- and active-controlled trial (N=482) involving two fixed doses of LATUDA (80 or 160 mg/day) and an active control (quetiapine extended-release), both LATUDA doses and the active control at Endpoint were superior to placebo on the PANSS total score, and the CGI-S.
SD: standard deviation; SE: standard error; LS Mean: least-squares mean; CI: confidence interval, unadjusted for multiple comparisons. B Included for assay sensitivity. Examination of population subgroups based on age (there were few patients over 65), gender and race did not reveal any clear evidence of differential responsiveness. Adolescents (13-17 years)The efficacy of LATUDA, was established in a 6-week, multicenter, randomized, double-blind, placebo-controlled study of adolescents (13 to 17 years) who met DSM-IV-TR criteria for schizophrenia (N=326). Patients were randomized to one of two fixed-doses of LATUDA (40 or 80 mg/day) or placebo. The primary rating instrument used to assess psychiatric signs and symptoms was the PANSS. The key secondary instrument was the CGI-S.
For both dose groups, LATUDA was superior to placebo in reduction of PANSS and CGI-S scores at Week 6. On average, the 80 mg/day dose did not provide additional benefit compared to the 40 mg/day dose. MonotherapyThe efficacy of LATUDA, as monotherapy, was established in a 6-week, multicenter, randomized, double-blind, placebo-controlled study of adult patients (mean age of 41.5 years, range 18 to 74) who met DSM-IV-TR criteria for major depressive episodes associated with bipolar I disorder, with or without rapid cycling, and without psychotic features (N=485). Patients were randomized to one of two flexible-dose ranges of LATUDA (20 to 60 mg/day, or 80 to 120 mg/day) or placebo. The primary rating instrument used to assess depressive symptoms in this study was the Montgomery-Asberg Depression Rating Scale (MADRS), a 10-item clinician-rated scale with total scores ranging from 0 (no depressive features) to 60 (maximum score). The primary endpoint was the change from baseline in MADRS score at Week 6. The key secondary instrument was the Clinical Global Impression-Bipolar-Severity of Illness scale (CGI-BP-S), a clinician-rated scale that measures the subject's current illness state on a 7-point scale, where a higher score is associated with greater illness severity. Table 37. The high dose range (80 to 120 mg per day) did not provide additional efficacy on average, compared to the low dose range (20 to 60 mg per day). Adjunctive Therapy with Lithium or ValproateThe efficacy of LATUDA, as an adjunctive therapy with lithium or valproate, was established in a 6-week, multicenter, randomized, double-blind, placebo-controlled study of adult patients (mean age of 41.7 years, range 18 to 72) who met DSM-IV-TR criteria for major depressive episodes associated with bipolar I disorder, with or without rapid cycling, and without psychotic features (N=340). Patients who remained symptomatic after treatment with lithium or valproate were randomized to flexibly dosed LATUDA 20 to 120 mg/day or placebo. The primary rating instrument used to assess depressive symptoms in this study was the MADRS. The primary endpoint was the change from baseline in MADRS score at Week 6. The key secondary instrument was the CGI-BP-S scale. 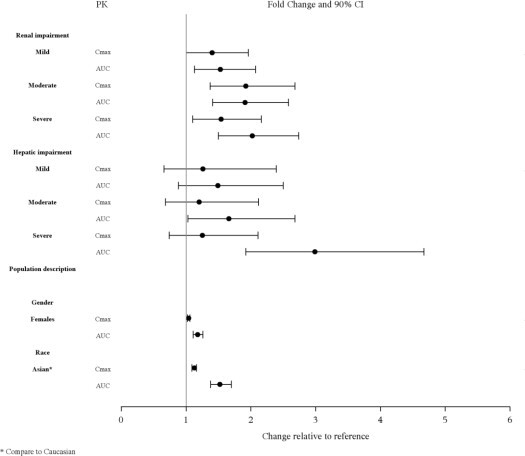 a Difference (drug minus placebo) in least-squares mean change from baseline. * Treatment group statistically significantly superior to placebo. Pediatric Patients (10 to 17 years)The efficacy of LATUDA was established in a 6-week, multicenter, randomized, double-blind, placebo-controlled study of pediatric patients (10 to 17 years) who met DSM-5 criteria for a major depressive episode associated with bipolar I disorder, with or without rapid cycling, and without psychotic features (N=343). Patients were randomized to flexibly dosed LATUDA 20 to 80 mg/day or placebo. At the end of the clinical study, most patients (67%) received 20 mg/day or 40 mg/day. The primary rating scale used to assess depressive symptoms in this study was the Children's Depression Rating Scale, Revised (CDRS-R) total score. The CDRS-R is a 17-item clinician-rated scale with total scores ranging from 17 to 113. The primary endpoint was the change from baseline in CDRS-R score at Week 6. The key secondary endpoint was the change from baseline in CGI-BP-S depression score. * Treatment group statistically significantly superior to placebo. To report suspected adverse reactions, call 1-877-737-7226. LATUDA is a registered trademark of Sumitomo Dainippon Pharma Co. Ltd.
Sunovion Pharmaceuticals Inc. is a U.S. subsidiary of Sumitomo Dainippon Pharma Co. Ltd.
© 2018 Sunovion Pharmaceuticals Inc.
[see Dosage and Administration (2.1 and 2.2)]. Table 1) with respective one-sided debossing. It is unknown whether the risk of suicidal thoughts and behaviors in pediatric and young adult patients extends to longer-term use, i.e., beyond four months. However, there is substantial evidence from placebo-controlled maintenance studies in adults with MDD that antidepressants delay the recurrence of depression. Monitor all antidepressant-treated patients for clinical worsening and emergence of suicidal thoughts and behaviors, especially during the initial few months of drug therapy and at times of dosage changes. Counsel family members or caregivers of patients to monitor for changes in behavior and to alert the healthcare provider. Consider changing the therapeutic regimen, including possibly discontinuing LATUDA, in patients whose depression is persistently worse, or who are experiencing emergent suicidal thoughts or behaviors. A potentially fatal symptom complex sometimes referred to as Neuroleptic Malignant Syndrome (NMS) has been reported in association with administration of antipsychotic drugs, including LATUDA. Clinical manifestations of NMS are hyperpyrexia, muscle rigidity, altered mental status, and evidence of autonomic instability. Additional signs may include elevated creatine phosphokinase, myoglobinuria (rhabdomyolysis), and acute renal failure. If NMS is suspected, immediately discontinue LATUDA and provide intensive symptomatic treatment and monitoring. Tardive dyskinesia is a syndrome consisting of potentially irreversible, involuntary, dyskinetic movements that can develop in patients treated with antipsychotic drugs. Although the prevalence of the syndrome appears to be highest among the elderly, especially elderly women, it is impossible to rely upon prevalence estimates to predict, at the inception of antipsychotic treatment, which patients are likely to develop the syndrome. Whether antipsychotic drug products differ in their potential to cause tardive dyskinesia is unknown. Given these considerations, LATUDA should be prescribed in a manner that is most likely to minimize the occurrence of tardive dyskinesia. Chronic antipsychotic treatment should generally be reserved for patients who suffer from a chronic illness that (1) is known to respond to antipsychotic drugs, and (2) for whom alternative, equally effective, but potentially less harmful treatments are not available or appropriate. In patients who do require chronic treatment, the smallest dose and the shortest duration of treatment producing a satisfactory clinical response should be sought. The need for continued treatment should be reassessed periodically. If signs and symptoms of tardive dyskinesia appear in a patient on LATUDA, drug discontinuation should be considered. However, some patients may require treatment with LATUDA despite the presence of the syndrome. 2 receptors, LATUDA elevates prolactin levels. Neither clinical studies nor epidemiologic studies conducted to date have shown an association between chronic administration of this class of drugs and tumorigenesis in humans, but the available evidence is too limited to be conclusive. Leukopenia/neutropenia has been reported during treatment with antipsychotic agents. Agranulocytosis (including fatal cases) has been reported with other agents in the class. Possible risk factors for leukopenia/neutropenia include pre-existing low white blood cell count (WBC) and history of drug-induced leukopenia/neutropenia. Patients with a pre-existing low WBC or a history of drug-induced leukopenia/neutropenia should have their complete blood count (CBC) monitored frequently during the first few months of therapy and LATUDA should be discontinued at the first sign of decline in WBC, in the absence of other causative factors. 3) should discontinue LATUDA and have their WBC followed until recovery. LATUDA may cause orthostatic hypotension and syncope, perhaps due to its α1-adrenergic receptor antagonism. Associated adverse reactions can include dizziness, lightheadedness, tachycardia, and bradycardia. Generally, these risks are greatest at the beginning of treatment and during dose escalation. Patients at increased risk of these adverse reactions or at increased risk of developing complications from hypotension include those with dehydration, hypovolemia, treatment with antihypertensive medication, history of cardiovascular disease (e.g., heart failure, myocardial infarction, ischemia, or conduction abnormalities), history of cerebrovascular disease, as well as patients who are antipsychotic-naïve. In such patients, consider using a lower starting dose and slower titration, and monitor orthostatic vital signs. Orthostatic hypotension, as assessed by vital sign measurement, was defined by the following vital sign changes: ≥ 20 mm Hg decrease in systolic blood pressure and ≥10 bpm increase in pulse from sitting to standing or supine to standing position. LATUDA may cause somnolence, postural hypotension, motor and sensory instability, which may lead to falls and, consequently, fractures or other injuries. For patients with diseases, conditions, or medications that could exacerbate these effects, complete fall risk assessments when initiating antipsychotic treatment and recurrently for patients on long-term antipsychotic therapy. As with other antipsychotic drugs, LATUDA should be used cautiously in patients with a history of seizures or with conditions that lower the seizure threshold, e.g., Alzheimer's dementia. Conditions that lower the seizure threshold may be more prevalent in patients 65 years or older. SchizophreniaIn adult short-term, placebo-controlled schizophrenia studies, seizures/convulsions occurred in 0.1% (2/1508) of patients treated with LATUDA compared to 0.1% (1/708) placebo-treated patients. LATUDA, like other antipsychotics, has the potential to impair judgment, thinking or motor skills. Caution patients about operating hazardous machinery, including motor vehicles, until they are reasonably certain that therapy with LATUDA does not affect them adversely. In clinical studies with LATUDA, somnolence included: hypersomnia, hypersomnolence, sedation and somnolence. Disruption of the body's ability to reduce core body temperature has been attributed to antipsychotic agents. Appropriate care is advised when prescribing LATUDA for patients who will be experiencing conditions that may contribute to an elevation in core body temperature, e.g., exercising strenuously, exposure to extreme heat, receiving concomitant medication with anticholinergic activity, or being subject to dehydration. Antidepressant treatment can increase the risk of developing a manic or hypomanic episode, particularly in patients with bipolar disorder. Monitor patients for the emergence of such episodes. In the adult bipolar depression monotherapy and adjunctive therapy (with lithium or valproate) studies, less than 1% of subjects in the LATUDA and placebo groups developed manic or hypomanic episodes. Esophageal dysmotility and aspiration have been associated with antipsychotic drug use. Aspiration pneumonia is a common cause of morbidity and mortality in elderly patients, in particular those with advanced Alzheimer's dementia. LATUDA and other antipsychotic drugs should be used cautiously in patients at risk for aspiration pneumonia. The following adverse reactions have been identified during postapproval use of LATUDA. Because these reactions are reported voluntarily from a population of uncertain size, it is not always possible to reliably estimate their frequency or establish a causal relationship to drug exposure. Hypersensitivity Reactions: Urticaria, throat swelling, tongue swelling, dyspnea, and rash. Clinical studies with LATUDA did not include sufficient numbers of patients aged 65 and older to determine whether or not they respond differently from younger patients. In elderly patients with psychosis (65 to 85), LATUDA concentrations (20 mg/day) were similar to those in young subjects. It is unknown whether dose adjustment is necessary on the basis of age alone. LATUDA is not a controlled substance. LATUDA has not been systematically studied in humans for its potential for abuse or physical dependence or its ability to induce tolerance. While clinical studies with LATUDA did not reveal any tendency for drug-seeking behavior, these observations were not systematic and it is not possible to predict the extent to which a CNS-active drug will be misused, diverted and/or abused once it is marketed. Patients should be evaluated carefully for a history of drug abuse, and such patients should be observed carefully for signs of LATUDA misuse or abuse (e.g., development of tolerance, drug-seeking behavior, increases in dose). No specific antidotes for LATUDA are known. In managing overdose, provide supportive care, including close medical supervision and monitoring, and consider the possibility of multiple drug involvement. If an overdose occurs, consult a Certified Poison Control Center (1-800-222-1222 or www.poison.org). 2S·HCl and its molecular weight is 529.14. LATUDA tablets are intended for oral administration only. Each tablet contains 20 mg, 40 mg, 60 mg, 80 mg, or 120 mg of lurasidone hydrochloride. ® and carnauba wax. Additionally, the 80 mg tablet contains yellow ferric oxide and FD&C Blue No. 2 Aluminum Lake. MEDICATION GUIDELATUDA (luh-TOO-duh)(lurasidone hydrochloride)tabletsWhat is the most important information I should know about LATUDA?LATUDA may cause serious side effects, including:Increased risk of death in elderly people with dementia-related psychosis. Medicines like LATUDA can raise the risk of death in elderly people who have lost touch with reality (psychosis) due to confusion and memory loss (dementia). LATUDA is not approved for the treatment of people with dementia-related psychosis. Increased risk of suicidal thoughts or actions in children and young adults. Antidepressant medicines may increase suicidal thoughts or actions in some children and young adults within the first few months of treatment and when the dose is changed. How can I watch for and try to prevent suicidal thoughts and actions in myself or a family member?Pay close attention to any changes, especially sudden changes in mood, behaviors, thoughts, or feelings. This is very important when an antidepressant medicine is started or when the dose is changed. To treat people 13 years of age or older with schizophrenia. Alone to treat people 10 years of age and older with depressive episodes that happen with Bipolar I Disorder (bipolar depression). With the medicine lithium or valproate to treat adults with depressive episodes that happen with Bipolar I Disorder (bipolar depression). Less than13 years of age with schizophrenia. Less than 10 years of age with bipolar depression. For the treatment of irritability associated with autistic disorder. Do not take LATUDA if you are:allergic to lurasidone hydrochloride or any of the ingredients in LATUDA. See the end of this Medication Guide for a complete list of ingredients in LATUDA. Taking certain other medicines called CYP3A4 inhibitors or inducers including ketoconazole, clarithromycin, ritonavir, voriconazole, mibefradil, rifampin, avasimibe, St. John's wort, phenytoin, or carbamazepine. Ask your healthcare provider if you are not sure if you are taking any of these medicines. Have or have had diabetes or high blood sugar, or have a family history of diabetes or high blood sugar. Are pregnant or plan to become pregnant. It is not known if LATUDA will harm your unborn baby. Talk to your healthcare provider about the risk to your unborn baby if you take LATUDA during pregnancy. Tell your healthcare provider if you become pregnant or think you are pregnant during treatment with LATUDA. If you become pregnant during treatment with LATUDA, talk to your healthcare provider about registering with the National Pregnancy Registry for Atypical Antipsychotics. You can register by calling 1-866-961-2388 or go to http://womensmentalhealth.org/clinical-and-researchprograms/pregnancyregistry/. Are breastfeeding or plan to breastfeed. It is not known if LATUDA passes into your breast milk. Talk to your healthcare provider about the best way to feed your baby during treatment with LATUDA. LATUDA and other medicines may affect each other causing possible serious side effects. LATUDA may affect the way other medicines work, and other medicines may affect how LATUDA works. Your healthcare provider can tell you if it is safe to take LATUDA with your other medicines. Do not start or stop any other medicines during treatment with LATUDA without talking to your healthcare provider first. How should I take LATUDA?Take LATUDA exactly as your healthcare provider tells you to take it. Do not change the dose or stop taking LATUDA without first talking to your healthcare provider. Take LATUDA by mouth, with food (at least 350 calories). If you take too much LATUDA, call your healthcare provider or poison control center or go to the nearest hospital emergency room right away. What should I avoid while taking LATUDA?Do not drive, operate heavy machinery, or do other dangerous activities until you know how LATUDA affects you. LATUDA may make you drowsy. Avoid eating grapefruit or drinking grapefruit juice during treatment with LATUDA. Grapefruit and grapefruit juice may affect the amount of LATUDA in your blood. Do not become too hot or dehydrated during treatment with LATUDA. Uncontrolled body movements (tardive dyskinesia). LATUDA may cause movements that you cannot control in your face, tongue, or other body parts. Tardive dyskinesia may not go away, even if you stop taking LATUDA. Tardive dyskinesia may also start after you stop taking LATUDA. Problems with your metabolism such as:high blood sugar (hyperglycemia) and diabetes. Increases in blood sugar can happen in some people who take LATUDA. Extremely high blood sugar can lead to coma or death. If you have diabetes or risk factors for diabetes (such as being overweight or a family history of diabetes), your healthcare provider should check your blood sugar before you start and during treatment with LATUDA. Increased fat levels (cholesterol and triglycerides) in your blood.weight gain. You and your healthcare provider should check your weight regularly during treatment with LATUDA. Low white blood cell count. Your healthcare provider may do blood tests during the first few months of treatment with LATUDA. Falls. LATUDA may make you sleepy or dizzy, may cause a decrease in your blood pressure when changing position (orthostatic hypotension), and can slow your thinking and motor skills which may lead to falls that can cause fractures or other injuries. These are not all of the possible side effects of LATUDA. How should I store LATUDA?Store LATUDA tablets at room temperature between 68°F to 77°F (20°C to 25°C). Keep LATUDA and all medicines out of the reach of children. General information about the safe and effective use of LATUDA.Medicines are sometimes prescribed for purposes other than those listed in a Medication Guide. Do not use LATUDA for a condition for which it was not prescribed. Do not give LATUDA to other people, even if they have the same symptoms that you have. It may harm them. You can ask your pharmacist or healthcare provider for information about LATUDA that is written for health professionals. LATUDA is a registered trademark of Sumitomo Dainippon Pharma Co. Ltd.; Sunovion Pharmaceuticals Inc. is a U.S. subsidiary of Dainippon Sumitomo Dainippon Pharma Co. Ltd. ©2018 Sunovion Pharmaceuticals Inc.
For more information, go to www.LATUDA.com or call 1-888-394-7377.